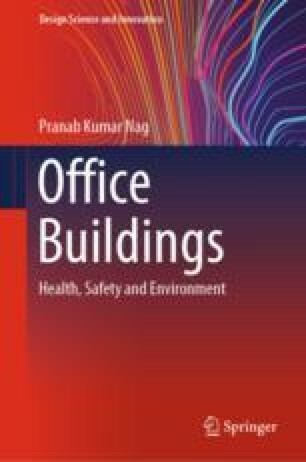 The interrelationships of spatial as well as behavioural components, such as the task design factors, group psychosocial traits have direct impacts on office design and workplace effectiveness. The office spaces, such as the enclosed cellular offices, open-plan office, co-working or shared space, the enclosures around a work area, and interpersonal distance, refer to as the recognized characteristics of organizational culture. That is, office space and workstation design, spatial density and proximity, biophilia and aesthetics influence the work process in the office and also occupant’s behaviour and performance. This chapter elucidates the psychosocial constructs of work environment relating to communication and social networking among co-workers for positive outcomes, whereas privacy is a multi-layer construct in the process of information control. Stress management, personal control, sense of belonging, territoriality, control and supervision are the identifiable dimensions that influence occupants’ innovation and collaboration, well-being and job satisfaction in the office environment. Charles, K. E., & Veitch, J. A. (2002). Environmental satisfaction in open-plan environments: 2. Effects of workstation size, partition height and windows. Institute for Research in Construction. National Research Council Canadá. Internal Report No. IRC-IR-845, Vol. 21, no. 03, 2007. http://irc.nrccnrc.gc.ca/ircpubs. Duffy, F., & Tanis, J. (1999). A vision of the new workplace revisited. http://dwp.bigplanet.com/pdkconsulting/nssfolder/pdfdownloads1/TanisDuffy1999.pdf. O’Brien, S. (2007). Color theory. http://www.colourtheory.net/articles/colour_psychology.htm. South Korean Government. (2013). Creative economy action plan. http://www.kdi.re.kr/about/gov_download.jsp?file_name=6995_01.pdf. Tomasco, S. (2010). IBM 2010 Global CEO Study: Creativity selected as most crucial factor for future success. http://www-03.ibm.com/press/us/en/pressrelease/31670.wss. Wright, A. (2007). Colour psychology—The colour affects system. http://www.colouraffects.com.